Access to medical information at the point of care is critical in ensuring safe and effective medical practices. MEG eGuide apps provide a way for clinicians to deliver their guidelines, protocols and clinical practice guides to staff members on their own mobile devices. We provide smartphone and tablet versions of clinical guideline apps that work on and offline so you're never without up to date clinical guidelines. Our speciality isn't limited to antimicrobial guidelines - MEG has solutions for distributing anaesthesia, neonatal, liver and kidney guidelines too. We also work with clients to deliver hospital navigation and rota distribution tools and the Point Prevelance Survey in Ireland. Does your hospital have guidelines that staff can access 24 hours a day 7 days a week via tablets and mobile phones? Contact us for more information and join our clients in Ireland, Australia and the United States. Looking for a digital solution to a gentamicin or vancomycin calculator? To assist in ensuring correct application of these antibiotics, MEG in conjunction with Irish hospitals, have developed calculators considering the factors necessary for accurate dosage. With excellent usability our calculator apps ensure precise results for dosage and can be built based on algorithms specific to your hospital. We have worked with The Rotunda Hospital, Dublin on an award winning postnatal VTE risk calculator and work closely with clients to ensure a purpose built solution. 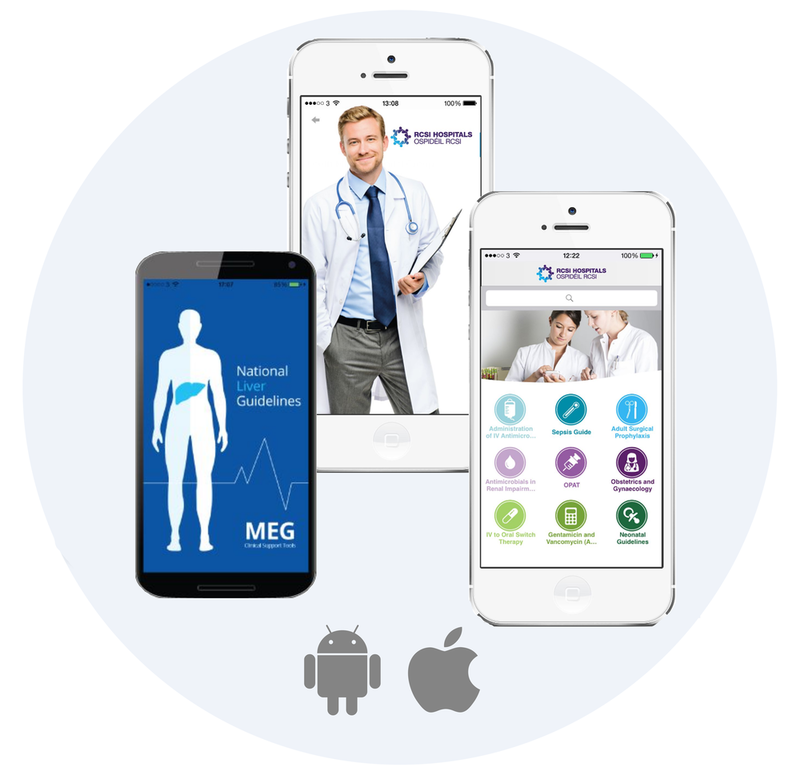 Your hospitals medical guidelines are hosted and distributed via an app to clinician's mobile devices from MEG's secure cloud based online dashboard. Hospital administrators can update guidelines as frequently as required and distribute them instantly via the publish function. You have full control of publishing and distribution and there are no limits on the amount of updates that you made to your guidelines - you're in control.